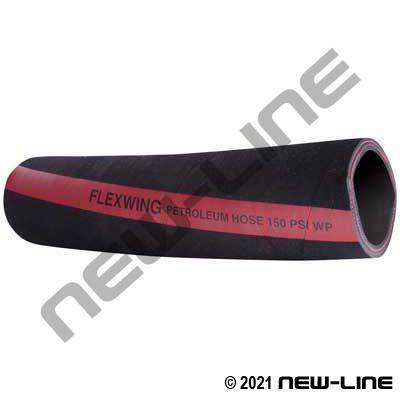 NL3020 is a brand name, popular, safe, reliable, rubber petroleum suction, discharge, or return hose for use with unleaded gasoline/fuels (less than 60% aromatic content), ethanol, diesel, kerosene, hydraulic fluids, hydrocarbons, and Biodiesel (the tube is resistant to Biodiesel, but the outside cover is NOT resistant to prolonged exposure to Biodiesel - see the NL3040). It is also resistant to fats, greases, animal/vegetable oils, hot/cold water (not food grade), and certain solvents. It is commonly used on tank truck (NOT designed for reel applications as it has a wire helix) and in-plant applications as well as for hydraulic return lines (ie. where a substitute for branded SAE100R4 can be used; refer to FC619/2661 for actual SAE100R4 hydraulic hose) or for marine jumper hoses (for short jumpers, also use stainless braided hose). Its cover is resistant to gouging, abrasion, and weathering. The standard colour is black but is also available with a red cover (NL3021) in full coils on special request (for colour coding purposes). For short lengths (i.e. 3ft) or permanent installations where the hose cannot be inspected or tested at regular intervals consider using a Stainless Steel braided hose. Construction: Tube: Smooth, high quality, black nitrile. Cover: Wrapped, smooth, black Chemivic (nitrile blend) with a red spiral stripe (6" size has a slightly corrugated cover for added flexibility). Reinforcement: Wire helix between synthetic textile plies. Detail Comments: Continuous lengths to 400' available on special request. 6" size has a slightly corrugated cover for added flexibility.